If you're anything like me, you have a love-hate relationship with technology. I LOVE that it can make my life easier, but sometimes the learning curve when starting out with a new program or device can be a turn-off. 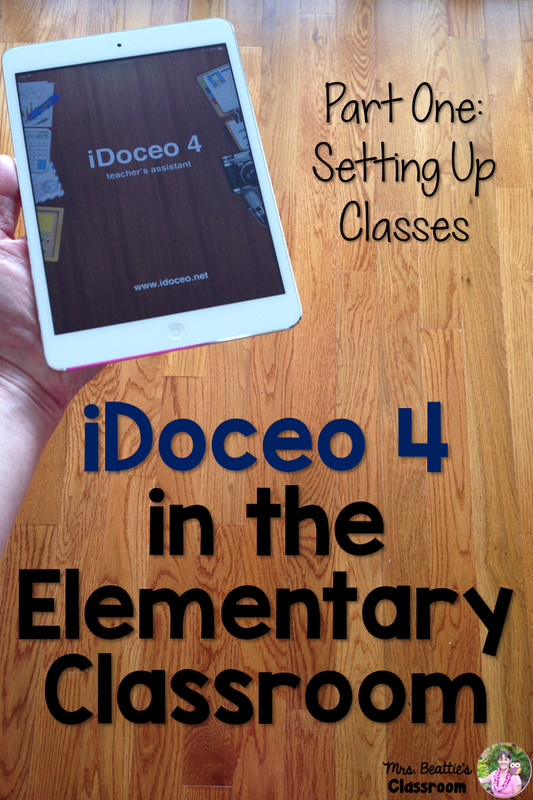 One of the best finds I've made since purchasing my iPad is iDoceo. I am in no way affiliated with the company that created it, nor am I being compensated in any way for these posts, I'm just interested in helping other teachers make their job a tiny bit easier. Begin by clicking the gear in the top-left corner and tapping "Working Mode" to ensure you are working in full-size mode. I don't see too much of a difference between it and the compact mode, but my tutorials will be based on the full-size mode. 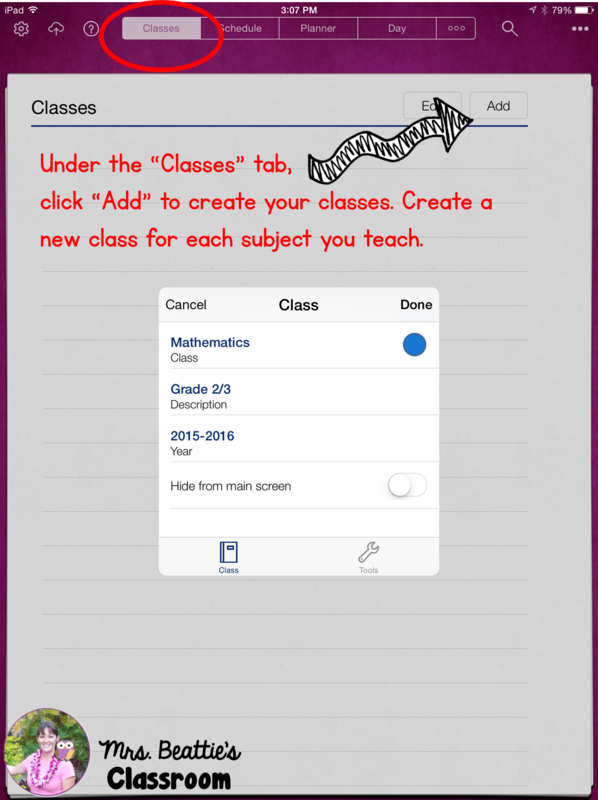 Select the "Classes" tab at the top and click "Add" to create your classes. When I first started working with iDoceo 3 this was where I encountered my difficulties. When I think of "My Class" I think of the group of students I'm working with, rather than the subjects I'm teaching. You should be creating classes for each of your subject areas. If you teach one subject to multiple classes, be sure to create a separate "Class" for each of them! 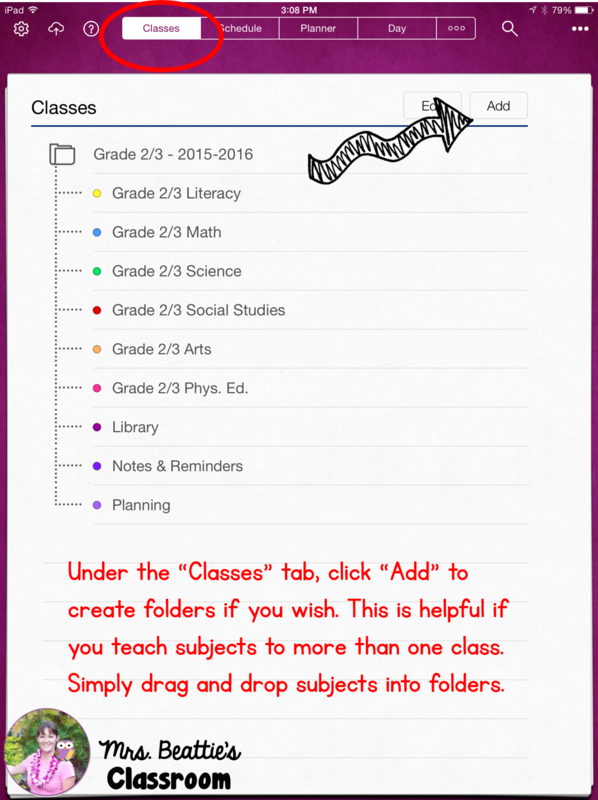 You can also create folders under the "Add" tab, making it easier to manage multiple groups of students. Look for the Bloglovin button or email subscription under the "Stay In Touch" header near the top of my page to follow my blog and be sure to receive the next posts in this series! I teach a 6/7 class and while there is some overlap (eg Language, PE), I find keeping separate Gr. 6 and Gr. 7 mark books helpful since they often have different assignments. I am wondering if you know of a way to handle this in iDoceo. I can see it is easy to create separate 6 and 7 classes for each subject, but then how does that work with my schedule and planner? Can I have 2 Science classes scheduled at the same time? Thanks for your help. Love the blog! That is a GREAT question, Mrs. Stephen! I don't exactly have an answer for you on that one. 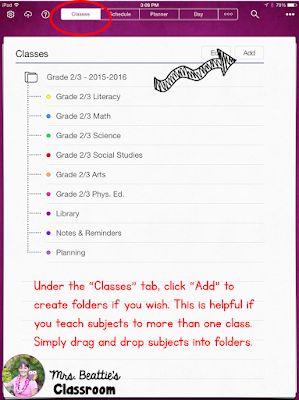 I have taught split grades for the past three years while using iDoceo, and have created one "class" for each subject and then simply organized the list alphabetically by grade so that I can focus my grading on one group or the other. It DOES mean that there are some times that I only insert grades for half my group for a particular task, but since I teach 2/3 most of what I do can be evaluated for everyone. I would suggest visiting the iDoceo website. They have quite an extensive help section where you may find additional information about organizing for a split class.